Looking to learn more are you? 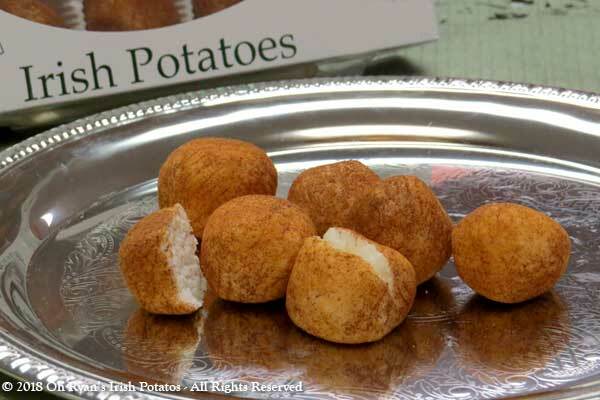 Of course Oh Ryan's Original Irish Potatoes aren't potatoes at all. What they are is delicious coconut cream centers rolled in super rich cinnamon that creates an unmistakable flavor sensation. So flavorful that many think it must be pure magic! For over 30 years our family has been crafting this delicious, seasonal and local Philadelphia area treat. The original of this flavor sensation is deep in lore but examples of them were spread around the cities Irish Neighborhoods more than 50 years ago when Candy Makers were looking for something to thrill children and their grown-ups after Valentines Day but still before other events kicked off. We now proudly carry the tradition forward by replicating the original potato like treat just as have been enjoyed for generations. If you'd like to know where to find them or order OhRyan's please get in touch >>.